Town Green joins the fun at The Grand Prix & Apizza Feast! 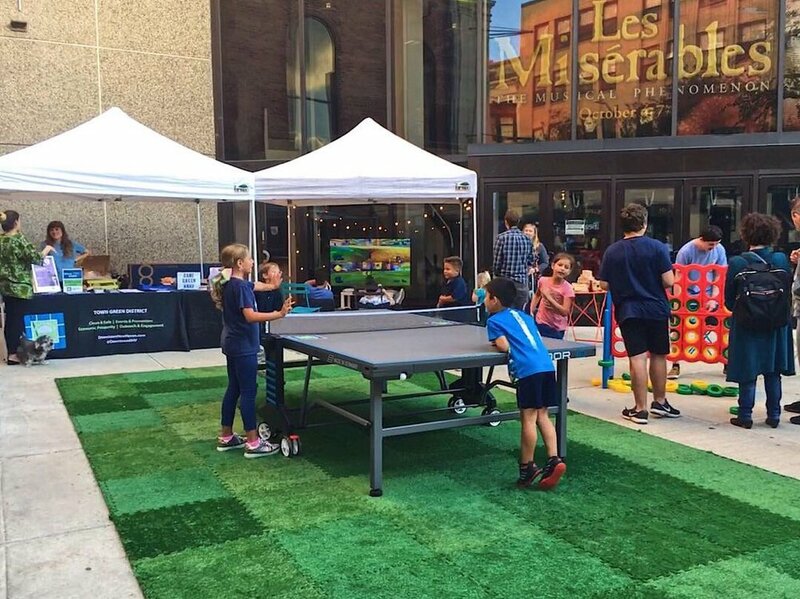 Stop by College Street to visit our “Game Green” - an interactive space for all ages featuring seating areas, ping pong, Mario Kart tournaments, corn hole, Big Jenga, and much more! Don’t forget to visit our tent to find out about more events coming to New Haven! The racing scene last year in downtown New Haven. New Haven Craft Beer Week is back! This 9 day series kicks off with the Fuzzy Cask Crawl, inviting you to test your tastebuds, visiting each location to compare cask variations of New England Brewing Company's Fuzzy Baby Duck's IPA. Throughout the week, each location hosts a unique you don't want to miss! Starting August 22nd, visit any participating location to grab an event passport. Photo taken in the English Building Market, 845 Chapel Street. In partnership with The City of New Haven, The Shops at Yale and all small businesses in Downtown New Haven, Small Business Saturday celebrates the unique community of locally-owned and ran shops, restaurants and more! Stop by the INFONewHaven Center at 1000 Chapel Street all day for giveaways, parking promotions, snacks, and prizes. Lunarfest is a day-long event offering arts and cultural programs for adults and children of all ages in celebration of the Lunar New Year! Attend for Chinese arts and culture workshops, talks, and demonstrations, including opera, music, exhibits, dances, painting, calligraphy, arts & crafts and much more! Town Green District is the proud Parade Sponsor of Lunarfest. Families and guests of all ages are invited to the St. Patrick’s Day Parade Family Fun Zone! Enjoy food trucks, arts and crafts, face painting, the Town Green Game Green, a petting zoo and much more! The New Haven County Firefighters Emerald Society Pipes & Drums band performs.